The Grange Movement reached Agincourt early, if not immediately, but it had long-lasting impact on the community’s institutions. A 1959 article by Myrtle Beinhauer in The Annals of Iowa outlines the formation of the movement nationally as well as the statewide network of granges (chapters chartered by the national office) that eventually grew to nearly two thousand. Organized at the behest of President Andrew Johnson, it was the response to O. H. Kelley’s¹ observations about Southern agriculture. Kelley’s report observed that, even though they were financially distressed, farmers had the “blind disposition to do as their grandfathers had done” and persist in antiquated and unproductive methods. 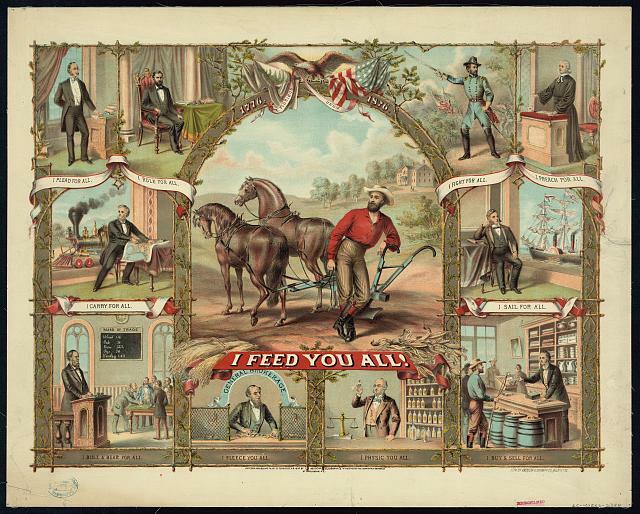 Organized on December 4th, 1867, as the National Grange of the Patrons of Husbandry, its purpose was the advancement of agriculture through education rather than through political action. Membership in the Grange was open to both boys (age 16+ and a $5 fee) and girls (age 18+ and $3) through the organization of local chapters, Iowa’s first was located at Buena Vista, near Newton, in 1868 and within three years that number had grown to thirty-seven. Remarkably, within another year, more than half the nation’s eleven hundred and fifty Granges were located in Iowa! Agincourt’s unit must have been charted in that initial wave. But, other that an aversion to overt political action, what consequences might have grown from the statewide association? Oliver Kelley’s original report had identified several issues that continued to trouble farmers set in their ways; finances were near the top of that list. Which may account for the organization of an early Agincourt bank — the Farmers’ and Mechanics” — though I don’t recall whether it had a state or a national charter. It also seems likely to have been active in establishing the fairgrounds and the Fennimore County Agricultural and Mechanical Society which operated it. Each of these helps to develope the timeline of significant events in Agincourt history, which is sketchy at best on some topics. Statewide, Grange chapters were also behind formation of the Agricultural College at Ames, which we can assume also had healthy support from Fennimore county. Some days I’m especially happy to ask silly questions. ¹ Minnesotans may recognize Kelley’s name from signs along the interstate directing you to the Oliver H. Kelley Farmstead, a National Historic Landmark operated by the Minnesota State Historical Society. By agincourtiowa in Uncategorized on Friday/23/November/2018 .